Once upon a time, on a sunny Tuesday about 6 months ago, I had a great new necklace design idea. This idea was so perfect in my mind’s eye, that I could see how the hammer marks would refract the light, and I could visualize the feel of how the metal would move and flow under my hammer. I knew with absolute certainty the speed and weight at which I should swing my hammer and the angle at which to hold the silver. The metal did not flow amiably under my hammer, but instead fractured and fought against me. My hammer marks didn’t refract the light in a beautiful shine, but rather were dull and lifeless. The lines of the metal didn’t flow in a clean sweep of gorgeous beauty, but were stilted and awkward. So much for perfection. After trying to force the project for about three hours, I gave in to the obvious. This was not the right design for this particular day and piece of silver. 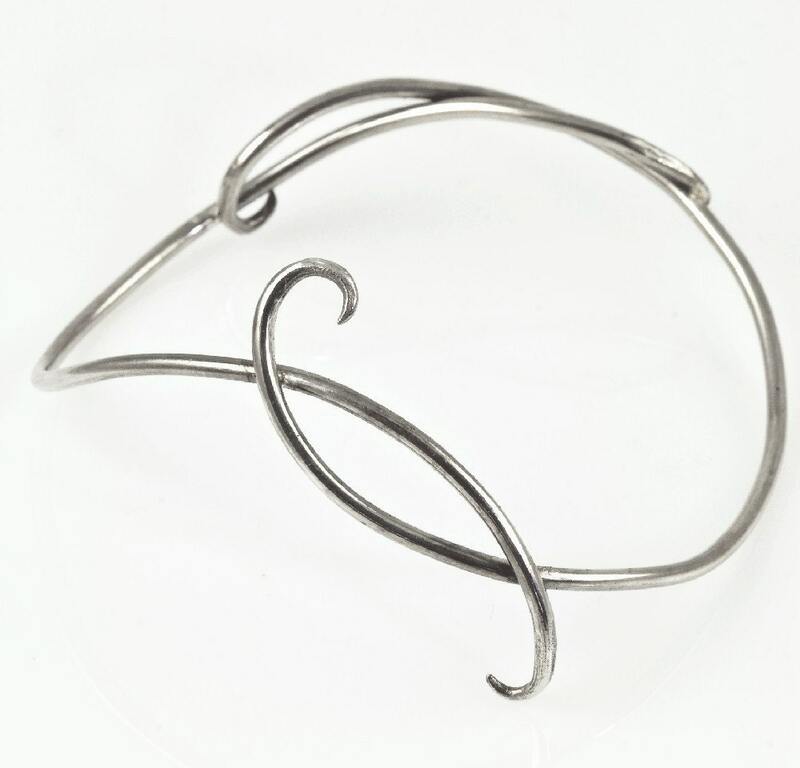 With reluctance, I shelved the necklace design, and turned the silver in to several bangle bracelets instead. 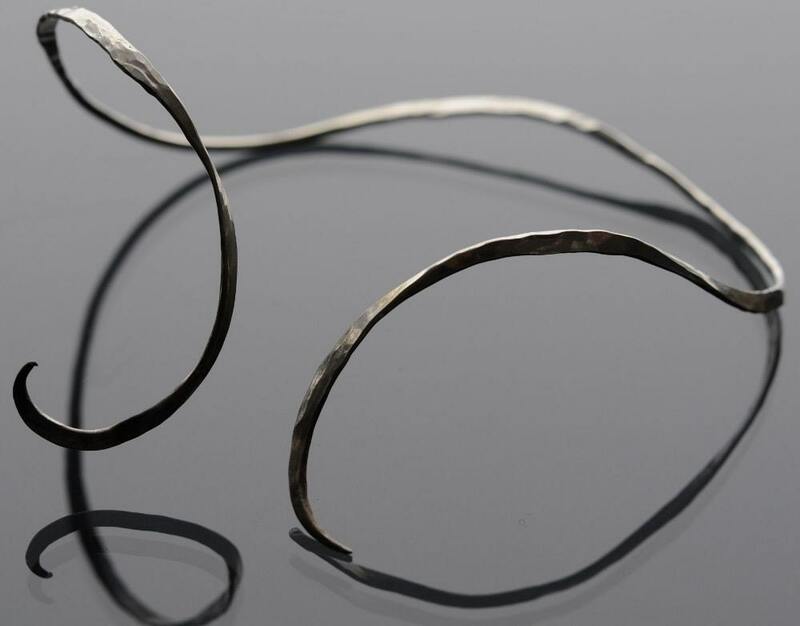 The bangles were very well received, and after thinking about it, I felt that I had a more perfect understanding of how silver flows and is shaped. Surely my misadventure was simply a fluke. I had learned anew how to shape silver according to it’s properties and my will, and this time would be so much better. I was nearly 85% positive. So about three months ago, I tried again. I have been forging various kinds of metals for over 10 years now, and I have come to the realization that I still have ALOT to learn, but this time around, I was extremely frustrated. I knew this design would be truly beautiful, as well as being a stunning piece, and it would be a wonderful sculptural adornment. I sighed deeply as I turned the silver into several pendants and a series of bracelets. About this time, and in an unrelated fashion, I managed to injure my wrist. As this wrist was the one I had broken several years ago, it is prone to re-injury, and as smithing is extremely hard upon one’s body, I reluctantly agreed to a period of convalescence. During this period of enforced rest, I started to entertain the notion that my perfect design wasn’t so perfect after all. I am only human, and am quite prone to mistakes, after all. So several weeks ago, after being cleared to return to work, I tried again. It was my design that was the problem after all. Where I had visualized a convex curve, what was really wanted was an anticlastic concave curve. Truly an easy mistake to make. Really. And if anybody believes that, I’ve got a bridge to sell you…. As I live and learn, I will probably create more designs, but I hope that I have learned to be more flexible about creating those designs. I am one of those people that has little scraps of inspiration and quotations in unexpected places, and I have now placed “YOU ARE NOT PERFECT” on a label on my hammer. Just a friendly little reminder to myself, as I am awfully stubborn sometimes. a happy accident! 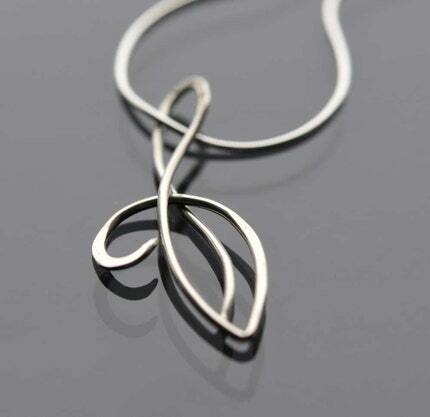 as the bangle & pendant are really quite lovely as is the necklace you eventually made with the revamped design! It’s called experience. We all go though it… I’m just glad you didn’t get too upset about it. That’s the key I think. Treating it all as a learning experience. I think I learn more from my failures than my successes. Successes lead you (me) into a false sense of security, failures usually lead me either to re-think or to persevere. Re-thinking is the better choice I believe in whatever endeavor. I want to see more anti-clastic & reticulated designs. So far I like those best of all. I guess my taste is more towards whimsy, although I do like your earlier forged steel sculptures too.